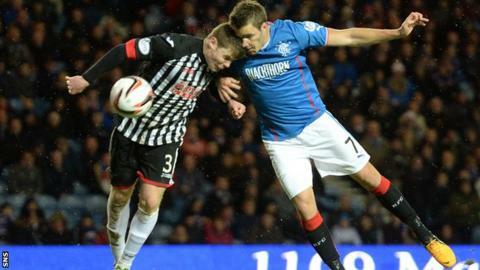 Rangers striker Andy Little will leave the club in the summer when his contract expires. The Northern Ireland international, 24, has been informed he is no longer part of manager Ally McCoist's plans. "I've loved being a Ranger - my time at the club was very special for me - and I want to thank people for that," Little said. Meanwhile, defender Chris Hegarty, 21, is likely to move on after being told he can find a new club by McCoist. The player's agent told BBC Scotland: "Both Chris and the club are in agreement that he needs first team football and Ally McCoist has indicated that if a club comes in for him either on a permanent basis or on loan he wouldn't stand in the way, which Chris appreciates. "He had a great season last year but was unlucky to injure himself scoring in the opening game of this season at Ibrox and missed the rest of the campaign. "The season has ended at the wrong time for him as he's in great shape and ready to play. He remains a Rangers player at this stage but the likelihood is he will start next season at another club." Little scored 25 goals last season but struggled with injury during Rangers' League One title-winning campaign this term. The forward, who joined the Rangers youth ranks in 2006 and made his first-team debut in 2009, has won eight caps. "I want to thank the manager and Walter Smith for bringing me into the first team as a young lad," added Little. "Most importantly, I want to thank the fans. You make the club what it is." He was ruled out for two months this season with a cheekbone injury, but scored five goals in 26 matches.